Happy Govardhan Puja Date 2019: Govardhan pooja which is also known as Annakut or Annakoot is a festival celebrated in India, basically it is an Hindu festival where devotees prepare and offers large variety of vegetarian food to their parmatmas (God) as a gesture of gratitude, and also to give their gods a vote of thanks and specially to worshiped Lord Krishna. 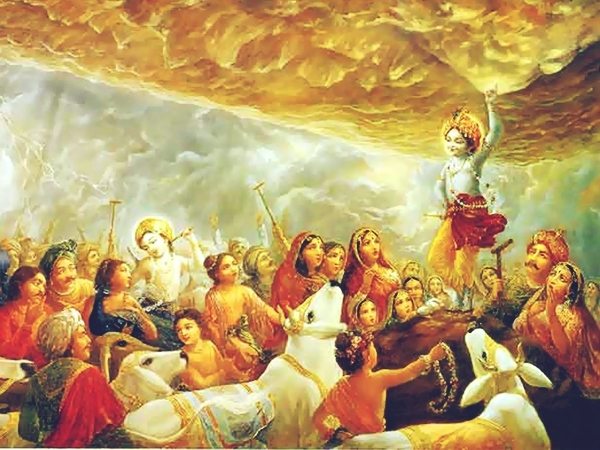 This day is also celebrated to remember the incident where Lord Krishna lifted the Govardhan hill in order to provide the villagers of Vrindavan shelter from torrential rains. This incident also shows that how god is always there to help his devotees in any severe conditions, so to show strong faith towards God people celebrates this puja each year. The festival is well celebrated by many Hindu dominations but it is particularly prominent among the Vallabh Sampradaya and also the Gaudiya Sampradaya and the Swaminarayan Sampradaya. The Govardhan Puja occurs on the first lunar day of Shukla Paksha in the Hindu month it is known as the month of Kartik, which is the fourth day of Diwali, the festival of lights. As the festival is celebrated for Lord Krishna’s heroic deeds, so its origins naturally begins from Lord Krishna’s childhood, Lord Krishna was spend most of his childhood memories in Braj. At this place many of Lord Krishna’s devotees and childhood friends experienced his divines and heroic deeds. Braj is the place where the origin of this puja take place. Among several heroic deeds or incidents made by Lord Krishna, one of the most important incident mentioned in Bhagvata Purana, involves where Lord Krishna lifts Mount Govardhan (Govardhan Hill), a low hill situated in the middle of Braj. According to Bhagvata Purana, people of the Braj used to celebrate the autumn season by paying respect to God Indra, as the God Indra is the god of rain and storm. So in order to have adequate rainfalls at their places they used to worship God Indra by celebrating autumn each year. Krishna was not in favor of the things that villagers used to do or follow, he used to think that villagers should not pray distant gods but rather should give appreciation to avatar of gods that are present on Mother Earth. Therefore he started a festival that paid tons of respect to Mount Govardhana, this respect is paid by offering ‘Giriyajna’. ‘Giriyajna’ – is known as the great offering of food and delicious items to the mountain Govardhan. Lord Krishna himself observed the form of mountain and also accepted the offerings of the villagers. As a result God Indra was very angered by seeing the devotion and attention of villagers diverted away from him towards Lord Krishna, and hence he threw a lightning storm and a torrential cyclone on the village for days. In order to protect the village from such calamity Lord Krishna lifted the Mount Govardhan on his little finger and hence the entire village came under it to protect them from the storm, the mountain acted as a shelter to the villagers. Indra who cause the storm and heavy rainfall for continuous for seven days, ultimately bowed to Lord Krishna, this story is the one of the most recognizable and popular among the masses of the ages. As a result the place Braj has become the major pilgrimage site for the devotees of Lord Krishna, a large no of devotees each year comes to worship their God. Annakut is celebrated on the fourth day of Diwali, and also in Hindus the fourth day of Diwali is celebrated as the New Year in the Vikram Samvat, thereby the rituals of Annakut are very much related to the five days of Diwali festival. Govardhan Puja is the most important thing of the Annakut, although some texts or people treats Govardhan Puja and Annakut as synonymous, in many variants Govardhan puja is performed. One of the oldest and most followed ritual is making small mounds or statues of cow dung which are placed on a flat surface and then lots of flowers are adorned and later it is worshipped by spreading flowers around them, prayers are also sung to Lord Govardhan. In many places of Hindu Mandirs, ‘Annakut’ is offered to the murtis on this day, a vast variety of vegetarian food is arranged by the devotees on the steps of the mandirs of Hindus, other foods like dal, vegetables, pulses, cooked grains, in the center of the mandir. In Swaminarayan mandir Sadhus starts the Govardhan Puja in the morning and finishes it off in the evening. ‘Thaal’ are the Kirtans which is sung by the Sadhus and the devotees, Kirtans are the spiritual songs that are sung in an energetic way by the Sadhus, the Kirtans are sung in the night time for the whole night, followed by dancing and singing poets, this whole scenario is known as ‘Jagran’. The ‘Thaal’ is followed by a grand Arti, in some mandirs this arti is performed several times till the food is offered infront of the deities. In the evening, devotees takes some portion of Annakut as Prasad that has been offered to God and is received as his mercy. Also in certain places the murtis are given bath of Cow Milk from top to bottom in the morning and then beautiful elegant clothes, ornaments are dressed to the murtis. Hindus takes Govardhan Puja as an important day to teach or pass their religious values to their children, and also they taught their children to asked for forgiveness from God and express their Devotions towards God. As the Annakut is mostly associated with Lord Krishna so the devotees of Krishna offers great things to the god on this day. For example: 250 kg of food was offered to Lord Krishna by ISKON temple in the year 2009. Hence the festival of Annakut or Govardhan Puja is celebrated in 3,850 mandirs in India and also celebrated on large scale outside the country.